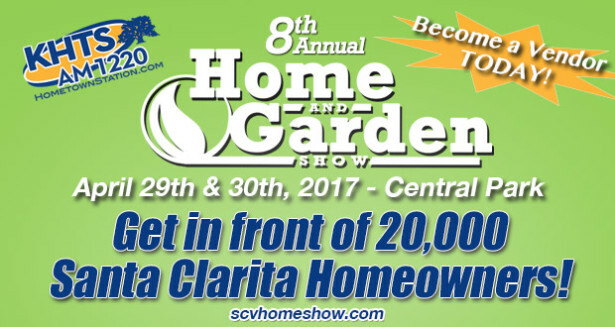 Over 20,000 upscale Santa Clarita Home Owners will visit our 8th Annual KHTS Home & Garden Show on April 29th & 30th at Central Park, in Santa Clarita, California. With over 525 booths it is the largest event in Santa Clarita, April 29th/30th 2017 at Central Park, combined with the Emergency Expo, Marketplace and the City’s Earth Day Arbor day. Unlike many trade shows, we limit our participation per category to provide a unique experience for our visitors and giving you a broader range of potential customers because only a few other vendors in your category will be participating. In addition to your booth, you will also receive a 7-minute prime time radio interview on KHTS, along with a YouTube video of the radio broadcast and two web landing pages on our two prime websites. Click here for a map of our show. Click here for other sponsorship opportunities.